As the developing of line trimmers, the trimmer line or strimmer line or weed eater string is well developed nowadays, and the quality and prices are vary in the market, different type of trimmer lines have the advantages and disadvantages. Choosing the correct nylon trimmer line is the key to ensuring the effectiveness of a grass trimmer & edge. Incorrect selection can result in reduced productivity, accelerated equipment wear, and added materials costs. Some consumers might be very confused about the right and best strimmer line to buy and use, well, I will introduce the quality string trimmer line and teach you how to buy and use the best one from China. There are three main diameter sizes of trimmer lines for different works in your garden, depending on how large of a yard and how thick your weeds are. Before you go and buy a string trimmer line, check your string trimmer to see what it is capable of holding, as most can only go handle a certain size. Refer to the product handbook if you’re unsure. Okay, now let’s get onto the actual lines. Light Work: 0.065 inches – 0.080 inches, good for residential front and back lawns with lighter weeds. The small jobs around the house. Medium Work: 0.085 inches – 0.105 inches, good for larger back and front lawns or lawns with heavier weeds and light commercial work. It is perfect for your bigger gardens where you have bigger weeds, and is often used for commercial areas as well. Heavy work: 0.110+ inches, good for Industrial landscaping, large estates,large yards, huge gardens, golf courses and other areas that need a large amount of trimming. The rounded shaped trimmer lines are for everyday home use, there is not job too small for the rounded line. Round Trimmer line is the standard, basic shape that won’t wear down as quickly as other trimmer lines. It is better for trimmer to trim grass edges or get rid of weeds around a residential yard, in other words, it is ideal for lighter, residential use with minimum weeds. It is also used for a minimum amount of weeds that don’t require a lot of time to cut. 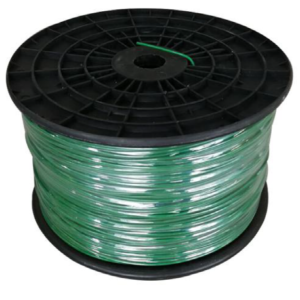 The round string line breaks less and is more durable against concrete, trees and etc. This is also the easiest trimmer line to replace in your trimmer. Round trimming line is the line you’re going to get in most residential grade, lightweight weed eating devices. It is the most common and is most suitable for light to standard jobs. It lasts longer than other weed eater string types, and is more likely to withstand contact with concrete, metals, and other hard materials that you may come in contact with while using your weed eater. Naturally, the shaft of this weed eater line is completely round and circular in shape. This type of line is generally lasts a lot longer if you use it for the smaller stuff, tends to be the cheapest and easiest to line to replace. 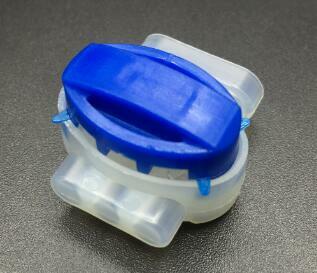 The round trimmer line produced by us is made from sturdy nylon components and is great for homeowner/residential use. Multi-sided trimmer line is for the landscaping professional, and made to stick on the end of high-wheel trimmers. The ribbed like design is to increase the ability to cut through weeds and big grassy areas, with no dramas. There are lines that have multiple sides to them-are more suited to a commercial job with a large amount that needs to be cut. These lines tend to stay “sharper” for a longer period of time, allowing you to get a much cleaner cut the first time around. This is important when doing a professional job, as you won’t want to waste any time going back over anything you’ve already cut once before (unless you want to waste a lot of time). Plus, your customers will be satisfied with the pristine, clean cut that you leave behind. This isn’t as important with rounded trimmer lines, as mentioned previously, because the rounded, circular lines are typically used for non-commercial purposes. If you have a larger yard, thicker weeds, or if you use the trimmer for commercial use, the multi-sided trimmer lines are the perfect option, and they are best used for medium sized jobs with heavier weeds or larger lawns. Multi-sided trimmer lines have multiple sides that produce a cleaner cut. These lines commonly come in the shape of a star, square or pentagon. A square shape as the name hints is a square line. This type of design makes it perfect to cut down the heavy weeds. and it will knock down anything you put in front of it. The edges of the square trimmer line allow it to cleanly slice through grass and heavy weeds. This line is great for professionals who have to tackle dense weeds on a daily basis. The commercial square trimmer line has been specially designed to prevent the outer layers from welding so easily,you can knock this line against rocks and trees and it will come out fine. Our square trimmer line is engineered and co-extruded and incorporates a high-strength inner core with a weld-resistant outer layer for long-lasting characteristics. Fits all standard trimmer heads. Main features of our square shape strimmer trimmer line: Added rigidity for improved cutting; Ultra weld resistance; Improved impact strength; Color coded by diameter size. Serrated blades have a similar use- they are mostly used for quality, commercial grade jobs. Serrated lines act like a long string of knives or teeth that easily rip through weeds and can easily rip through the absolute toughest jobs in minimal time. Best for: Medium to large size jobs for commercial jobs, ideal for landscapers. These trimmer lines slice through heavy weeds and thick grass quickly and efficiently, which will save your time. However, multi-sided trimmer lines break easy when they come in contact with stones, fences, curbs, sidewalks and etc. Your spiral shaped string trimmer line is best used in commercial areas, where you have noise limitations. 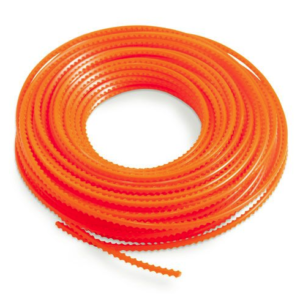 These twisted trimmer line is perfect for heavy and thick weeds. If you use trimmer for rugged commercial use, then, a twisted trimmer line is the right product for you. Twisted Trimmer line adds strength, improved efficiency and reduces noise levels. This line is a step up from the round style line and offers durability when hitting concrete or hard surfaces. This trimmer line can reduce trimmer vibrations and noise levels while giving you a clean, even cut. Spiral shaped lines work best with electric and battery powered string. Twisted grass trimmer strings are like multiple round lines wrapped around each other. These lines have the benefits of a round line, like being more resistant to hard surfaces, as well as having the added benefit of better weed cutting. There are claims made that these lines reduce the amount of vibration in your weed trimmer and that they tend to be more quiet, but so far I have not personally seen that to be the case. Twisted lines tend to be the most durable lines out there, so if you want something that will last, then this is the choice for you! This spiral string used an advanced spiral design to give the user a cleaner cut, and works well on heavier foliage. I managed to hit the pavement a few times and the even the edges of the road using this string, and it never split or broke off like other spiral lines I’ve used in the past. Best for: heavy duty jobs, where you have noise restrictions. With serrated edges that act like teeth, this line quickly saws through thicker grass blades, while leaving a cleaner trim. Serrated edge trimmer line is best used for your property which have a lot of weeds and commercial use. Serrated trimmer lines are used for heavier jobs with thicker weeds and more area to cover. With edges that act like teeth or a kitchen knife, this serrated line can quickly saw through grass blades and thick leaves, leaving a cleaner trim. This trimmer line has extra cutting power and can be used for medium-heavy jobs. A serrated trimmer line can cut through weeds easily and quickly to keep your trimming time at a minimum. It is important to know what materials the strimmer line is made from. In this review, we will be going over a couple different types of lines (the most common) nylon, and titanium string trimmer lines. Nylon- nylon trimmer lines are the very common materials. They are a hardened, synthetic monofilament that works well in nearly all weed cutting situations. (These are your go-to weed trimming lines). That, coupled with the correct shape and line diameter, makes for a great weed cutting line. 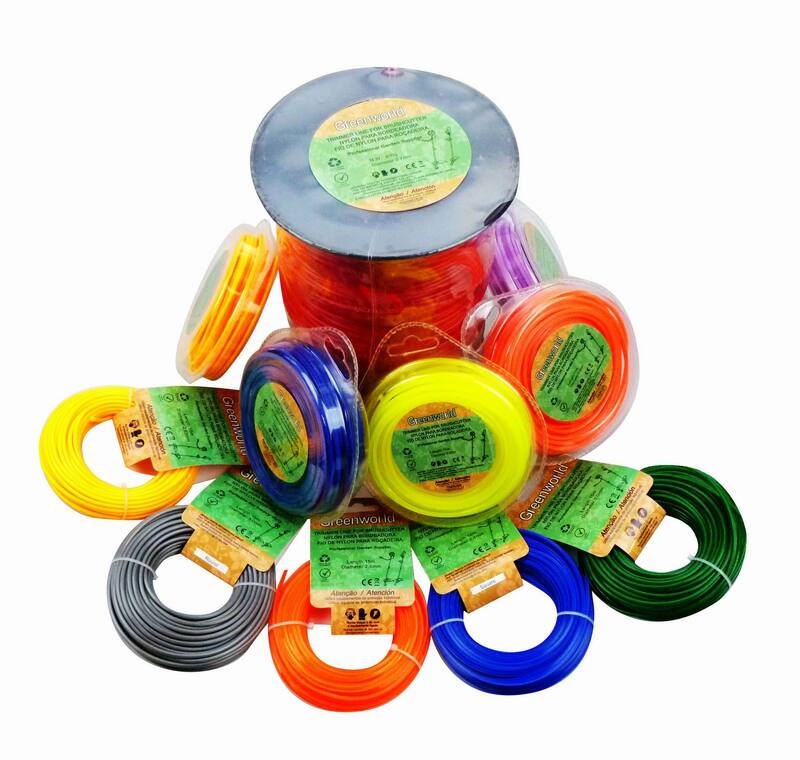 With the development 3D printers, nylon string could be easily made from home in the near future and will be perfect for your gardening trimmer tool! Titanium- A second, and perhaps not as well known line type is titanium. Titanium lines are amazingly efficient and are sort of a new thing in the string trimming world. I suspect that more and more people will start using titanium lines due to their superior cutting power. The titanium string trimmer lines the “nex-gen”, if you like of string trimmer lines. A titanium line performs better on all levels. Faster acceleration, reduces fuel consumption, lowers noise and has level flight characteristics. It can fit all standard trimmers too. However, they do cost a bit more, and using them is kind of overkill. You probably won’t need to ever use a titanium line unless you just want to cut up things you probably shouldn’t cut up. Still, titanium lines are fantastic and could be the future of string trimming lines. In conclusion,now you have a brief overview of various types string trimmer lines and what they’re best for. It won’t be difficult to buy the best trimmer line for your line trimmers. Keep in mind that it’s important to find the right line for the right job, to get the right finish on the property you’re working on. We are always working on developing the best trimmer line for the best use of different kinds of line trimmers. Please contact us for more information.